Here’s what happened in last night’s game. Each PC gets 1,480 xp, enough to reach 13th level. The PCs rush to the Old Troll Wall where they need to help Captain Marius Mannarin and the men of the town guard (Humphrey, Bob, Pike and Felcher) defend it from an airborne assault: three wyverns and a blightborn troglodyte riding on a manticore are approaching. Townspeople scatter in all directions to get out of there. The flying opponents prove challenging for the PCs who mostly lack powerful ranged attacks. Hrothgar climbs the 20’ high wall but unfortunately gets knocked to the ground by a wyvern’s claw as it flies past. Sora takes to the air herself and attacks one of the dragon-like creatures in melee, while Ulthar throws hand axes. Juma uses his hellish rebuke and then lightning lure to bring the wyverns down to the ground, and Gil transforms into a pillar of flame and throws alchemist’s fire. The troglodyte scatters some black seeds of some sort over the battlefield, then uses strange magic to ensnare Ulthar with unnatural black roots and to fire acid lances at the guards. His manticore mount fires spike volley after volley at the defenders. Meanwhile, the town guard are holding their own: Captain Mannarin, clearly inspired by the presence of the Juma Gang, leaps from the wall on to the back of a wyvern, clinging on for dear life as he plunges his sword into the reptile. Pike proves to be a deadeye shot with his crossbow and is the first to kill one of the wyverns. “Lucky” Bob is sadly the first guard to perish, despite Ulthar’s efforts to keep the guardsmen alive with his inspiring words. Humphrey then follows his captain’s heroic example and jumps on to the back of the wyvern which has just managed to shake Mannarin off. He doesn’t last long though, dying from the monster’s poison sting. Sora’s javelin of lightning kills the troglodyte, then Juma teleports onto the manticore’s back, although he soon falls off. The PCs shout to the old man who ran into the gate house to hide and he raises the portcullis, allowing Hrothgar to charge through and kill the wyvern battling Mannarin. The manticore lands to attack Gil and finds itself surrounded. It takes to the air and just manages to escape. The PCs and their allies have a little time to heal themselves but their rest is interrupted by the arrival of Aelius the master builder, who has come to see if the wall still holds. There are trolls coming! The party hastily position themselves by the gatehouse and put Mannarin, Pike and Felcher next to the weak wall section on the right flank. The next wave of attackers is led by two ice trolls and four grimlocks, followed by an ogre warhulk and a pair of nothics. One troll smashes through the wall where Sora and Juma are positioned. Then, Gil’s incendiary detonation goes off, killing all four grimlocks, and Hrothgar leaps off the wall to attack the second troll. Once the giant humanoid is down, the gnoll attacks one of the nothics. Ulthar goes to reinforce the guardsmen as the ogre has now broken through the weak masonry; he also leaps down from the top of the wall. Juma heads that way too, leaving Sora to kill the first troll on her own. Fortunately, Gil’s fiery spell is still active and neither troll gets up again. The ogre kills brave Felcher; then wounded Captain Mannarin withdraws under orders from Ulthar. Hrothgar kills his nothic opponent, leaving just the ogre and the second one-eyed aberration standing. The PCs fail to surround the ogre, though, allowing him to make one last desperate charge at Mannarin, but fortunately the captain survives the onslaught. 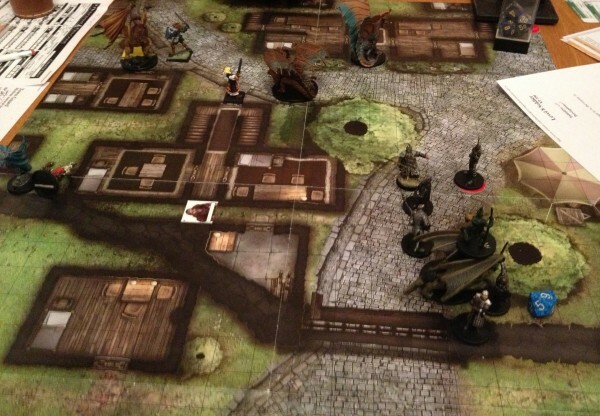 Finally, both attackers are slain and the party are able to catch their breath again. Amazingly Pike has survived too. As they wonder what will happen next, the road is torn apart as thick vines burst from the ground…..
Oh man, I wanna do a "hold the line" episode now. Something of a shame we couldn't do all three encounters last night but the first one took longer than expected as the PCs struggled to deal with the flying monsters. By the time we finished the second one it was around midnight so we decided to call it a night. There's a similar series of encounters in the excellent 3.5 adventure Red Hand of Doom too - well worth checking out.